Sharon Creech has always been my jam. I was completely obsessed with her books growing up. Even today, I rarely reread books, but I have read Sharon Creech’s books several times. I still have some of the copies I owned from my childhood. I was super excited to see a new Creech book coming out and couldn’t wait to get to spend time with this eARC, which I got through Edelweiss. 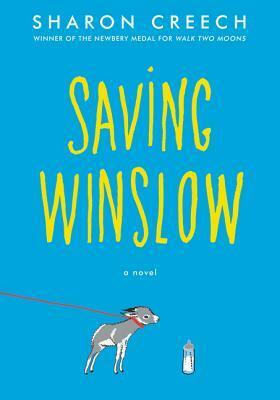 Winslow is adorable and you will have a great time with him. Louie does not have a great track record with keeping animals alive, but he is desperate to have a pet. When his uncle’s donkey gives birth to a sickly foal, Louie is determined to keep this creature alive. He researches everything that goes into caring for a donkey and gives his new pet Winslow all of the love he has to offer. While everyone keeps warning Louie that Winslow probably won’t make it, Louie keeps loving his donkey and begins connecting to other children in the neighborhood through his pet. This was a sweet novel. It was quick and adorable. I love that the main animal character is a donkey. I thought it was an interesting jumping point to explore human loss through an animal.